Exclusive Mossy Oak Break-Up Country camouflage and the most powerful ATV engine at 91 hp will have you itching to take the 2019 Outlander Mossy Oak Hunting Edition out scouting. Wider, revised suspension makes the most of legendary Rotax power. ENGAGING 91-HP ROTAX V-TWIN ENGINE: The all-new 91-horsepower Rotax 1000R liquid-cooled V-Twin engine, with four valves per cylinder and single overhead camshafts is remarkable for its—dare we say it—more refined thrills. Renowned for flexible reliability in harsh conditions and easy maintenance, Rotax engines have seen every corner of the world—and that's not a boast. 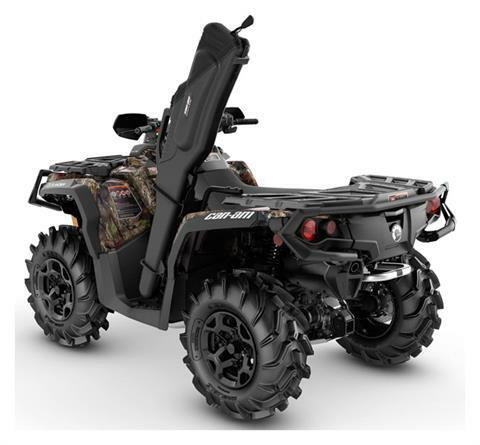 HEAVY-DUTY PROTECTION AND BACKWOODS CAPABILITY: Everything you want and then some: from heavy-duty front and rear bumpers, Kolpin 6.0 Impact Gun Boot, full skid plate package, and heated grips, the Mossy Oak Hunting Package is factory-fit with essential hunting features. 3,000-LB. WARN WINCH WITH ROLLER FAIRLEAD: This powerful winch with a 3,000 lb. 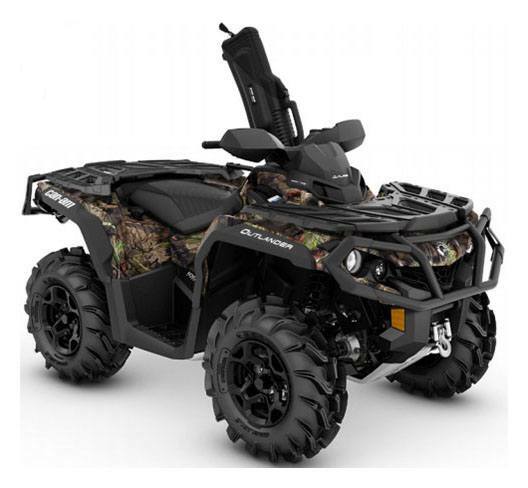 (1,361 kg) capacity is factory installed and can handle the toughest situations, an indispensible tool when tackling conditions that include hunting, ranching, mud holes—and helping your friends keep up. 26-IN CARLISLE ACT TIRES AND 12-IN CAST-ALUMINUM WHEELS: Performing as well as they look, 12 in. (30.5 cm) cast-aluminum wheels with less unsprung weight and improved strength are matched with durable 26 in. (66 cm), 6-ply Carlisle ACT tires with a tread that delivers both a comfortable ride and strong off-road grip. HARDWORKING STANDARD FEATURES: An industry-leading 1,650 lb. (750 kg) towing capacity, front and rear racks with LinQ attachments points, and multifunction gauges will make the Outlander your preferred companion for work and play.